Since its inception in 1995 as a trim level for the iconic Subaru Legacy Wagon, the Subaru Outback – now a distinct model – has defied categorization. Neither a typical SUV nor what we normally see as a crossover, the high-riding all-wheel drive wagon brings together utility, creature comforts, and the ability to go places other wagons and crossovers dare not tread. Showing its Legacy roots, the Outback shares some features with its older, more reserved kin, but rumbles down its own ruggedly independent path. The 2017 Subaru Outback, redesigned in 2015, comes in six trim levels, equipped with either a four-cylinder or six-cylinder engine depending upon trim level. 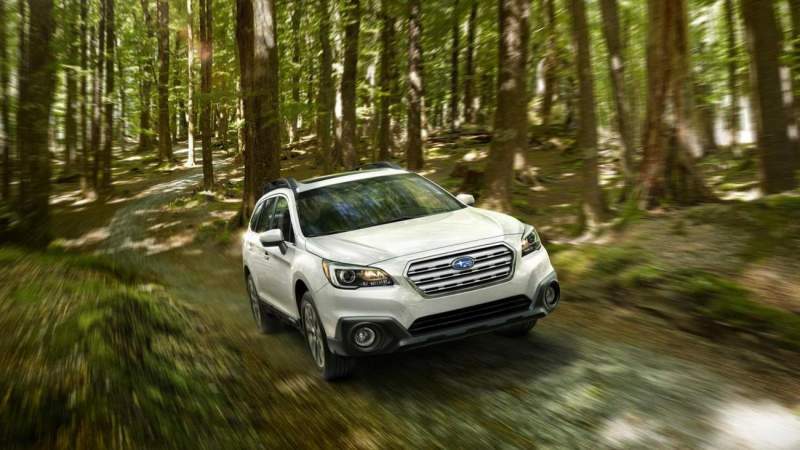 Outback 2.5-based models sport a horizontally opposed four-cylinder 2.5-liter engine, which pushes out 175 horsepower – a continuing evolution of the “boxer” engine famous among Subaru fans for its reliability and stability enhancing low center of gravity. Upscale 3.6-based models are powered by Subaru’s 3.6-liter six-cylinder. The flat six, now a staple powerplant in Subaru’s lineup, cranks out 256 horsepower. Towing capacity for the 2.5-liter engine is rated at 2,700 lbs, while the 3.6-liter six-cylinder can pull up to 3,000 lbs. With a curb weight of 3,580 lbs for base-engine models and 3,856 lbs for six-cylinder wagons, the 2017 Outback’s leisurely acceleration won’t win many stoplight races or blow your hair back when launched off the line. The thirstier 3.6R runs from zero to 60 in 7.1 seconds, while the 2.5-liter Outback wanders across the finish two seconds later. On the highway, where the power is more useful, acceleration feels decidedly faster for all models. However, performance is well-matched to the burly wagon’s buyer demographic, prioritizing family-hauler utility and remarkable prowess on unpaved roads with respectable fuel efficiency numbers – with a gas mileage of up to 25 city / 32 highway. While no pavement-wrinkling hot rod, the Outback does have the ability to power itself out of a dusty, off-road rut – even with half the front axle off the ground, a feat with which many competitors may struggle. Manual transmission fans might be disappointed to find the clutch pedal missing. All Outback models sold in the U.S. now come with a continuously variable transmission (CVT), designed to provide the perfect gear ratio at all times. Canadian Outback models still have a six-speed manual transmission available. 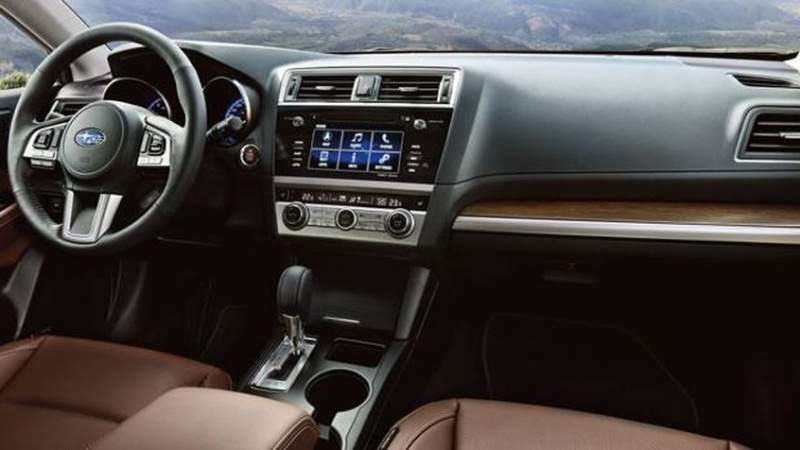 As a consolation for shift-addicted junkies, Subaru provides a manual mode for the CVT, which allows you to use steering wheel mounted paddle shifters to cycle through the gear ratios in situations where you might want more control. Handling and cornering ability are better than expected for a vehicle of this weight and height. While the Outback is no slot car, the wagon is just as capable winding through scenic mountain roads as it is kicking up dust trails where the pavement ends. Body roll is obvious, but the Outback remains composed under pressure. Steering responsive fog lights point where you steer, lighting the road ahead – before you get there. Blind spot monitoring flashes a light in your mirror if you engage the turn signal while another vehicle is in your blind spot. A power liftgate with adjustable height and memory settings safeguards the tailgate’s finish in low clearance areas. Darkened privacy glass tames summer heat, reduces glare, and stops curious passersby from seeing in. Subaru’s EyeSight front collision avoidance system detects distance and closing speed with cars ahead, sounding a warning or even applying the brakes when the system detects a risk of collision. The Outback’s rear bench seat provides room for three passengers in the back with independent adjustments to recline the seats slightly. However, the split bench is better suited for two adult passengers due to the center hump transmission tunnel and shoulder-bumping proximity for larger passengers. A large storage area in the rear is chock full of cubby holes for stashing goodies and hooks are provided for taming wayward grocery bags. Rear seats fold forward with a convenient pull handle located near the tailgate to add more storage. Thoughtfully, a 12-volt power supply is hidden in the trunk, useful for powering air pumps, lanterns, and other outdoorsy doodads. Subaru measures cargo capacity at 73.3 cubic feet with the seats folded down. The Outback comes equipped with a full size spare tire where many other models have gone to a fix-a-flat can – which won’t help if a tire is sliced open – or with a temporary spare, which leaves you dubious of its durability. To their credit, Subaru has avoided low-profile tires for the Outback. Instead, the Outback rolls with taller sidewall 60 or 65 series tires, which find a good balance between handling and comfort, mounted on tastefully understated 17 or 18-inch rims. 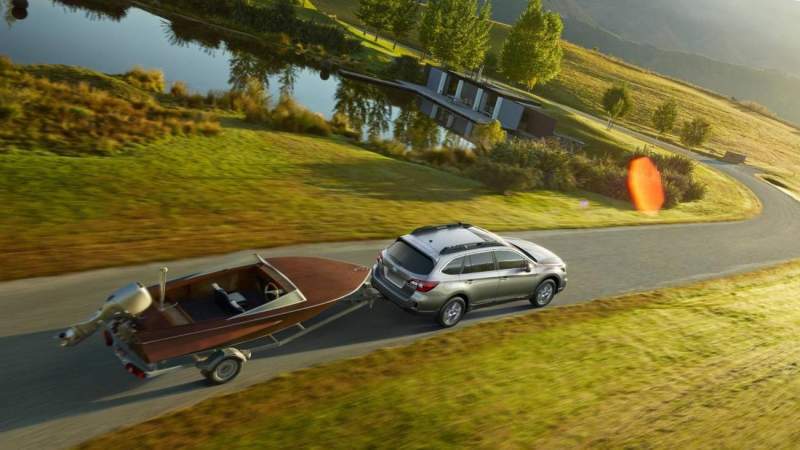 The Luggage rack, which lends the Outback a taller profile, can be repositioned to carry rooftop cargo of all shapes and sizes, with included tools stowed under the floor mat in the rear hatch.